Coming NEXT week and totally free…..CLEAN WITH ME! If you have been wanting to try my homekeeping routine, have questions about it, or just feel like it needs some demystification, you are going to LOVE the CLEAN WITH ME event (it’s FREE!) next week! 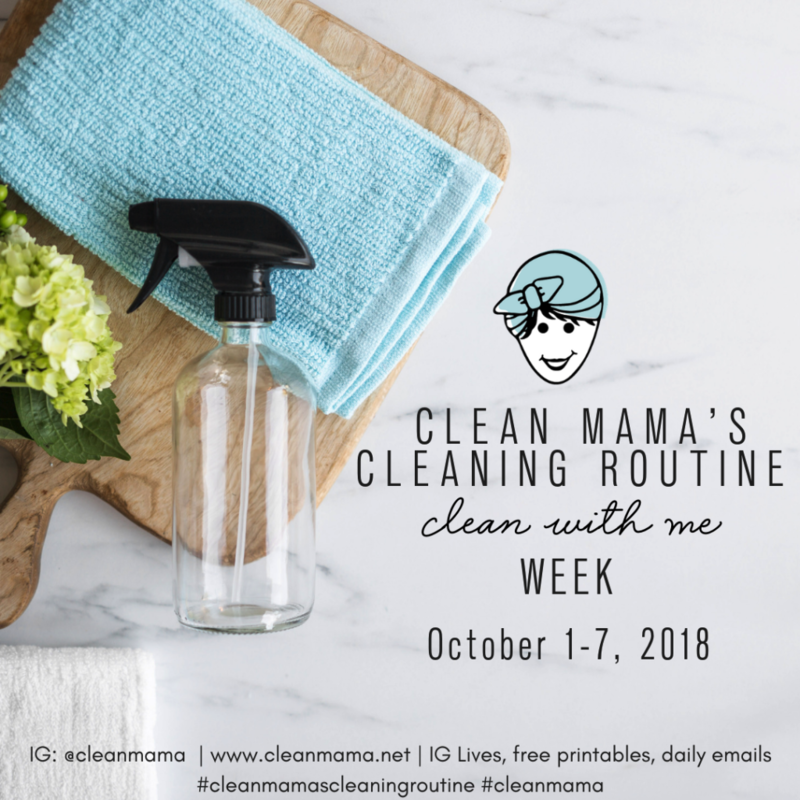 If you want to try cleaning RIGHT along with me, I’m going to host a ‘clean with me’ for the first week of October! I’ll be doing Instagram LIVES all week long, answering your questions and sharing simple cleaning tips with you. When you sign up, I’ll also send you the October homekeeping calendar, my cleaning routine printable, AND you’ll also get an email each morning helping you through my routine. You have to sign up to join (even if you are on my email list) – Go here to sign up for the challenge! If you haven’t tried my cleaning routine – anyone can do it with any schedule. I created it years ago but perfected it in the busiest season of our lives – I was working full time, pregnant with our 3rd baby, and running Clean Mama. I promise you – with a little commitment and a little time every day, weekends do not have to be devoted to cleaning. Everyday a little something is all it takes! Join me and tell your friends – it’s a week that just might change your life! Go here to sign up for the challenge! I’m trying to download the free printable for next week, October 1, cleaning and it keeps coming up “error”. Thank you for your help with this! You’ll get an email with the printables attached once you sign up! Let me know if you are still experiencing issues. What if we do not use Instagram? Thank you for your quick response to me signing up for the challenge. However, I could not get the routine printable, I got two of the calendars. Can you tell me how to get the routine printable? Thank you. Email me – I’ve also included it on the Monday email. I signed up but have not received any emails. I am not seeing your email address on any of my lists but I just signed you up!